Between all our book emails and school work flying around, it's taking a lot to remind me to eat. One of the ways around being so busy I simply skip whole meals is taking meetings at chill restaurants, where you can loiter a little bit, have outlets for phone charging, and some semi-healthy menu items. 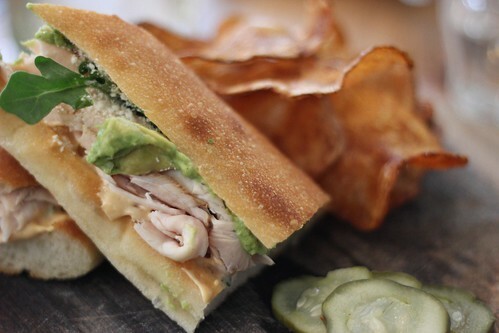 Like this sandwich, the Gobblecado, from Peels. I don't usually go for the turkey sandwich, possibly due to years of dieting. But this sandwich comes with slices of ripe avocado, a dusting of cotija cheese, and a small layer of chili mayo--three things I will never hate on. It helps that the turkey's smoked and tastes like actual turkey, not some amalgam of chemicals and salt. 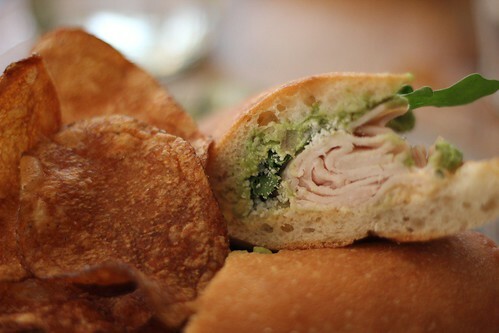 And since every sandwich needs some sort of side, they give you homemade potato chips. No word on whether they taste delicious actually in the sandwich. I really enjoyed Peels for brunch! Definitely want to check it out for a regular lunch now. That sandwich looks delish!